February 6, 2013  Also: What to do when a book makes you cry on public transportation; Amazon launches its own currency; and Ping Fu's memoir comes under attack. February 4, 2013  Chris Kyle, who wrote a bestseller about his time in Iraq and the more than 150 insurgents he killed, created a foundation that tried to help "emotionally and physically wounded veterans." The man who allegedly killed Kyle was one of those veterans, Kyle's friends and authorities say. 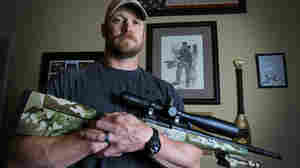 February 3, 2013  Former Navy SEAL Chris Kyle and another man were killed at a gun range in Texas on Saturday. The alleged shooter was arraigned Saturday on two counts of capital murder.